The most popular and most commonly fired cartridge in the United States is the .22 rimfire. It is estimated that over 2.2 billion rounds of this ammunition are produced each year in the United States. There are four types of .22 rimfire ammunition: the .22 Short, the .22 Long, the .22 Long Rifle and the .22 Winchester Magnum rimfire (Figure 6.1). 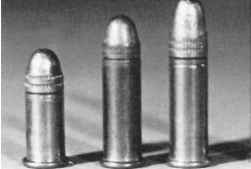 The Flobert BB cap was the ancestor of the .22 rimfire cartridge. It was developed in 1845 by necking down a percussion cap and inserting a lead ball. The primer was the sole propellant. Subsequent development by Smith & Wesson resulted in the .22 Short cartridge. Introduced in 1857, this is the oldest commercial metallic cartridge. It was loaded with a 29-gr., conical-shaped lead bullet with a diameter the same as that of the case and with outside lubrication. A heel was put on the back of the bullet, so that it could be inserted into the case. The case then was crimped into the bullet. The cartridge originally was loaded with 4 gr. of black powder. The .22 Long cartridge appeared in 1871. This consisted of a lengthened case (the current .22 Long Rifle case), loaded with the 29-gr. Short bullet. Five grains of black powder were used as a propellant. The .22 Long Rifle cartridge appeared in 1887. It consisted of the .22 Long case loaded with a 40-gr. bullet and 5 gr. of black powder. This is the most useful and most accurate of the rimfire cartridges. In the years following the introduction of these three rimfire cartridges, there were a number of significant evolutionary changes. 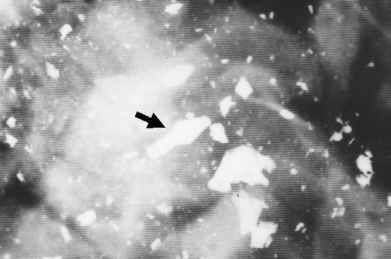 Smokeless powder and the hollow-point design appeared in the 1890s; noncorrosive priming was introduced by Remington in 1927. In 1930, the first high-velocity loadings appeared. In these loadings, bullets of the same weight are propelled at higher velocities than the standard loadings. Figure 6.1 From left to right: .22 Short, .22 Long, .22 Long Rifle, and .22 Magnum.